The festive season is here to bring smiles and happiness. 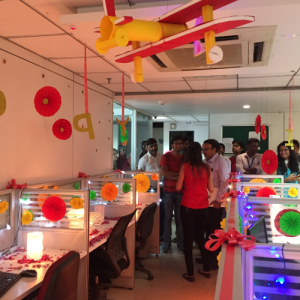 Diwali celebration at Synsoft is a perfect package of joy, rejuvenation, creativity and surprises for every team member. 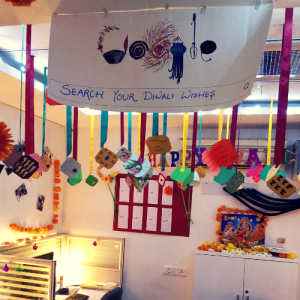 As always, we had some fun filled Diwali celebration activities lined up for Synsoftians this year round. 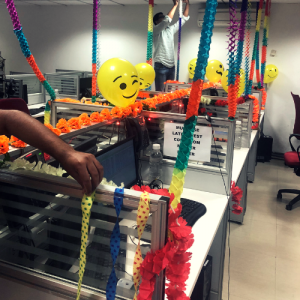 While having a Traditional day has become a ritual from the past few years, we also like to do something innovative and happening, that every person of Synsoft looks forward to. And as a matter of fact, this year’s Lane-decoration event broke all records in enthusiasm and innovation! The teams were all set in order of their seating. Many used their tea and lunch breaks to put their heads together to decide the theme and ideas for the upcoming event, in advance. No one knew what the other teams had planned and people kept their ideas secret, creating an unexpected wave of curiosity flowing in the office for days together. The event stirred artistic skills, handicraft abilities and creative punk out of logical brains. As the D-day began, it brought great chaos and rush into the workplace. People were seen walking in loaded with their handmade ensembles and art weapons to set the stage for an unimaginably beautiful world. The first lane decor themed after showcasing the Prominent Food across the Festivals of India. An interesting concept I must say! Each desk in the lane exhibited a brief about a State festival of India and freshly made festival-speciality of that State was served at the desk. Apart from being very informative and interesting, this became a delicacy center for everyone! The second section aimed to convey a message of having an Eco-Friendly Diwali celebration this year. The adornment was entirely handmade and devoured the use of plastic or any other environment-hampering material. Several handmade paper crafts decorated the lane in an amazingly artistic and creative manner. Brilliantly coloured frills, handmade lights, and thoughtful messages conveying the importance of environment, bedecked the section, displaying both pride and humility. Then there was a team that converted their entire lane into an amazing City of Snow! There was cotton snow everywhere… Snowman, Snow Castle, Snow Academy, Igloos, bonfire, Snow Theme Park, Ice Lake, an entire Snow Township, Eskimos and Penguins and even a working model of a Ropeway, so much so that the place felt cold! What took the judges fancy was “Incredible India”! 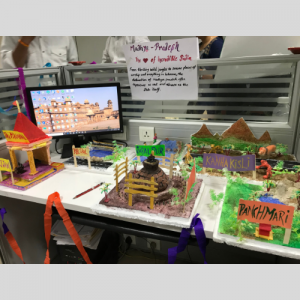 Through its concept, this team @Synsoft demonstrated some wonderful places to visit in States across India. The embellishments were neatly carved and accurately depicted some of the wonders that Incredible India boasts of, spread across its many states of Jammu and Kashmir, Punjab, Uttar Pradesh, Delhi, Rajasthan, Gujrat, Madhya Pradesh, Maharashtra, GOA and Kerala. It was a sight to behold! 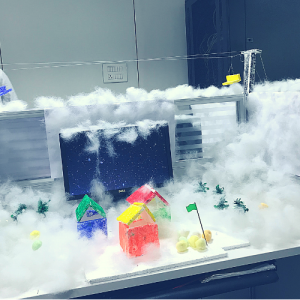 Another slice of Synsoft devoted their entire effort in decorating their area so beautifully, that it seemed that Diwali was right there! Diwali decoration was brought forth in its complete grandeur, Coloured frills, diyas, and art, converted the entire place from its cables and devices, into a room full of festivities! Last but not the least, was a section titled “Synsoft Ki Diwali”. The idea was to wish every single Synsoftian a Happy Diwali in his/her own specific manner. 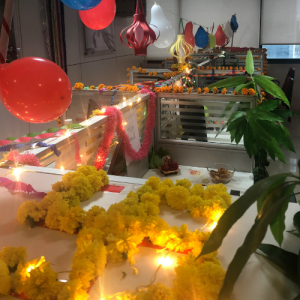 Here we saw cards hanging out of the ceiling each carrying Diwali wishes for a Synsoftian, in a hilarious way that conveyed the person’s most prominent reactions in the recent working past at Synsoft. One wall of this section, the SUGAR CUBE, displayed empty envelopes, one in the name of every person @Synsoft. Here, every individual from Synsoft could write messages for anyone else, anonymous or named. It was a happening corner as everyone had something to write and to read! There was also a Selfie Frame to capture the moment of Diwali 2k18. It turned out to be an unforgettable experience for us Synsoftians, and, true to its promise, Diwali celebration delivered smiles and happiness across the board! We saw great connect and enthusiasm and team members enjoyed to the core. I must mention our wonderful new batch of freshers for whom it became a great way to connect and build memories with all other members. No Synsoftian went empty handed as each one was filled with joy, good wishes, and appreciation. A perfect kick-start to Diwali was here. BOOM ! !